Resistivity imager logs, also called microscanner or FMS or FMI logs, carry an array of electrodes on pads used to produce an electrical image of the formations seen on the borehole wall. Acoustic image logs, also called televiewer or CBIL logs, use a rotating transducer to measure acoustic impedance images over the entire borehole wall, as well as an acoustic caliper. Microscanners have better vertical resolution and dynamic range than televiewers, but televiewers see the entire wellbore while microscanners usually see less than 100%. On earlier microscanner tools, the image arrays were on only two of the four pads, so several logging passes of the tool had to be merged together for better borehole coverage. Using this technique, from forty to eighty percent wellbore coverage could be achieved. Newer tools now have four or eight active imaging pads, reducing the need for repeat passes to obtain 100% coverage of the borehole wall. In addition to the array electrodes, the tool also has ten standard dipmeter electrodes (8 measure electrodes plus 2 speed buttons) as well as a directional cartridge containing accelerometers and magnetometers for orientation input to the standard dip computations. The electrical images are made by applying a gray scale to the resistivity wiggle-traces produced from the electrodes on the tool. 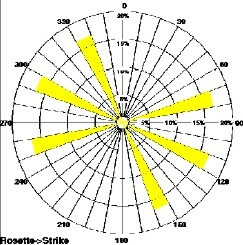 In this way, low resistivity zones appear dark and high resistivity, low porosity intervals appear white. Since the array on each pad is two and a half inches wide, irregular features, such as vugs and fractures, show up as dark spots and lines on the images. Colour tones may be used instead of grey. The image depth scale is usually 1:20 or 1:40, and the X axis is scaled from -180 to +180 degrees around the borehole, putting North in the middle of the track. Examples are provide above. A dramatic near vertical fracture can be seen. Two vertical scales are used: one for reconnaissance and one for detail evaluation. 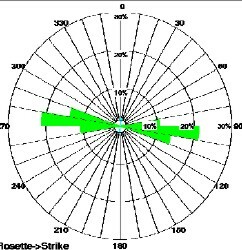 Fracture orientation is roughly NNW - SSE dipping at more than 80 degrees. Other images on these two figures illustrate induced fractures, borehole breakout, inter-bedding laminations, slump brecchia, vugs with fractures, and stylolites. 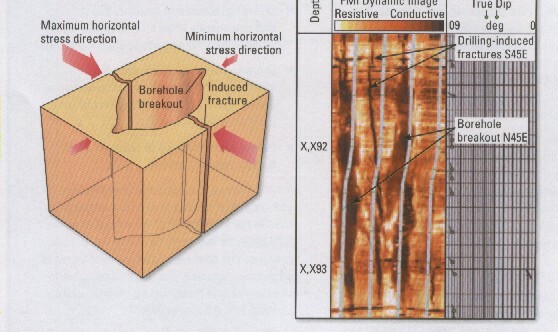 Fractures should produce a higher contrast anomaly than other porosity features because the fractures are flushed with conductive borehole fluid and there is exaggeration of the anomaly due to breakout of the wellbore on the fracture. 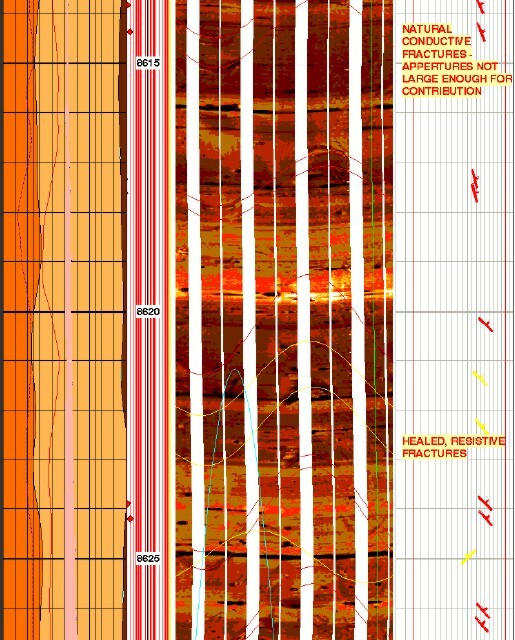 The fractures are sometimes masked, however, by extremely conductive vugs, so both the gray scale images and the electrical wiggle-trace data are analyzed to identify fractures. Resolution of the micro-scanner is about 10 mm, but contrast between fractures and rock is so good that thinner events, as thin as a few microns, can often be seen. Micro-scanner images give a very good visual correlation to core and allow the interpretation of small and large scale sedimentary features in the formations. The identification of fractures, along with fracture orientation, and the ability to differentiate them from high angle bedding features is possible. Further processing of the images to generate fracture frequency and fracture aperture is now routinely applied to the newest formation micro-imaging (FMI) logs. Older logs can be reprocessed for frequency and aperture only if data tapes still exist. The product of frequency and aperture is fracture porosity. Typical Resistivity-At-Bit (RAB) image log shows gamma ray at left, resistivity image, dip tadpoles, and 3 resistivity curves on the right. 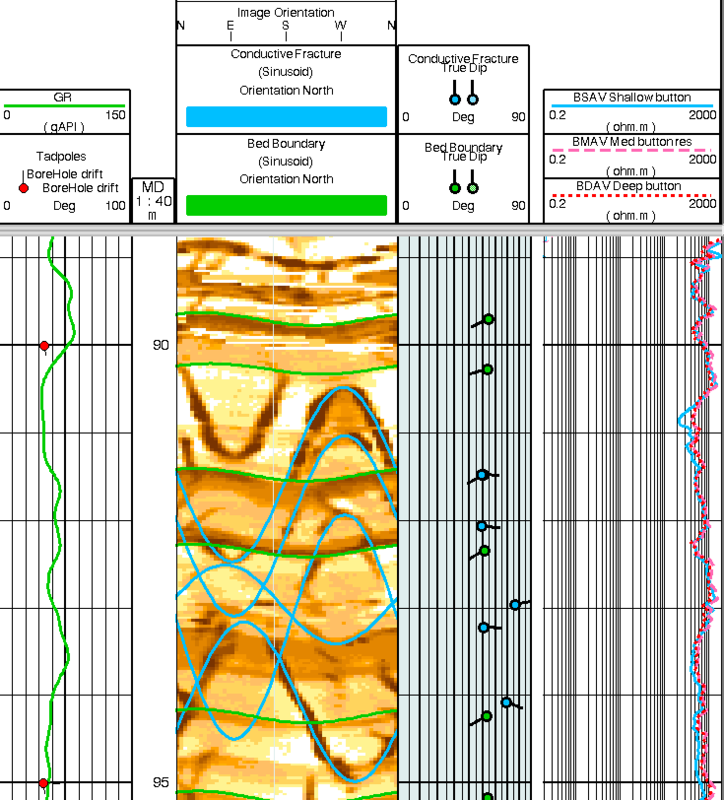 This image illustrate open fractures (with blue traces) cross-cutting bedding (in green). This is an RAB image of an induced fracture )borehole breakout), not a natural fracture. Induced fractures run parallel to the borehole axis. Natural fractures almost always cross the borehole. 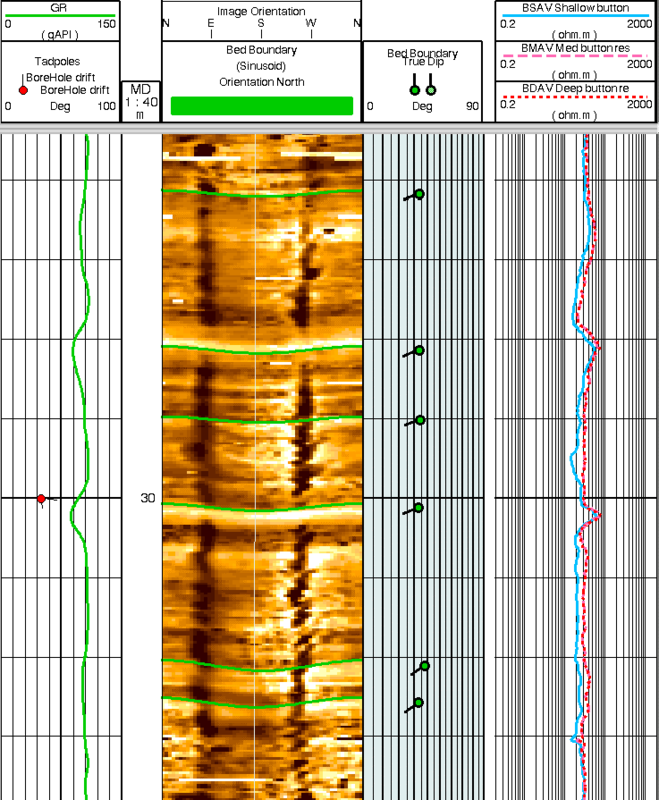 The acoustic image log (borehole televiewer) is similar in appearance to a resistivity image log (formation micro-scanner), but uses an ultrasonic derived, directionally oriented, 360 degree view of the borehole wall. Such an image, created by a conventional televiewer, has sufficient resolution to see major fracture systems in good hole conditions. The hole must be round, smooth, and filled with light weight mud to get really good images. The tool must be well centered. These requirements are not met in most fractured zones, but logs are still run for fracture identification and they are useful in many cases. Trade names for these tools are not as well known as others: CBIL (pronounced Cybill) stands for Continuous Borehole Image Log and UBI for Ultrasonic Borehole Imager. Versions of these tools are also used for cement evaluation in cased holes. The televiewer log of the wellbore is a representation of the amount of acoustic energy received at the transducers, which is dependent upon rock impedance, wall roughness, wellbore fluid attenuation, and hole geometry. For example, a smooth surface reflects better than a rough surface, a hard one better than a soft one. A surface perpendicular to the transducers reflects better than one that is skewed. Therefore, any irregularities such as fractures, vugs and irregular porosity will reduce the amplitude of the reflected signal. 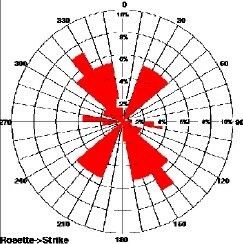 Acoustic Image log with travel time (detailed borehole radius) at left and amplitude (acoustic impedance) on the right. Fractures show up as black sinusoid shapes on both images. 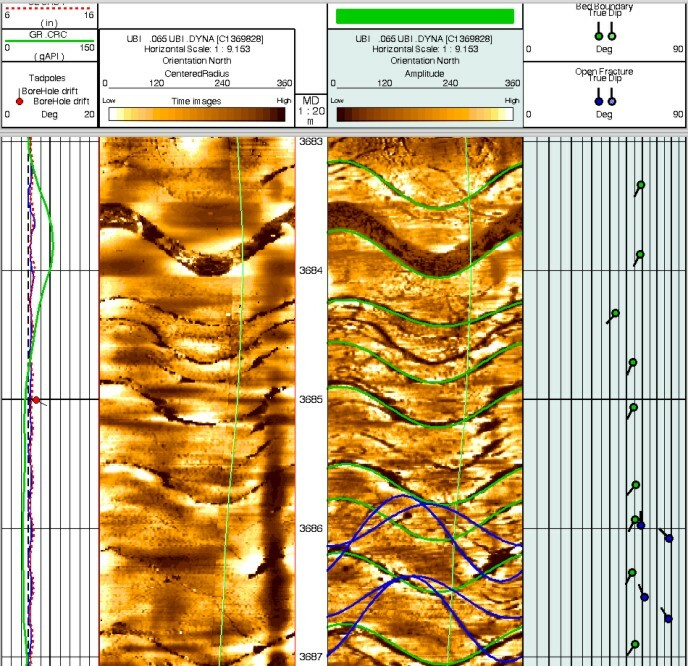 Comparison of resistivity image log (left) and ultrasonic image log in the same borehole. The higher spatial resolution and the higher dynamic range of the resistivity image is clear. Black colour represents low acoustic impedance on CBIL/ UBI, or low resistivity on FMI, in this case representing fractures (near vertical) or shale beds (near horizontal). The resolution of the tool allows us to determine events of about 10 mm in width. Fractures are often accentuated in the wellbore by the drilling process, which breaks out the fracture on both sides of the opening. If it were not for this breakout, most fractures would not be seen by the televiewer as their width is commonly less than 1 mm. An example of an actual image from an older televiewer log, and an interpretive sketch with artificially enhanced resolution. The formation microscanner is much more sensitive to fractures than the televiewer. The electrical conductivity of the fluid in the fracture is 1000 or more times higher than the surrounding rock, compared to about 4 times for acoustic televiewer signals. In addition to the amplitude image, the travel time image is also recorded on modern logs. This is the travel time from tool to wellbore wall and back to the detector through the mud. This image is effectively an acoustic caliper log, and is used to locate breakouts. Considerable research is being conducted to enhance the televiewer images, using both arrival time and amplitude of the sound waves, plus computer methods for image enhancement, especially edge enhancement to resolve fractures and bed boundaries. 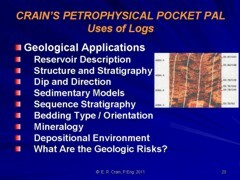 Modern televiewer logs can be used effectively in more rugged boreholes than older versions because of the new processing techniques. Be aware of the age of the log before you start your analysis. Since the televiewer image is oriented to magnetic north, we can determine the dip direction of a fracture or bedding plane from the azimuth of the troughs of the sinusoid. The dip angle can be calculated from the same equation as given for the microscanner. CAUTION: The direction scale on the top of the image varies between service companies. One uses a scale with North in the center of the image (same as for FMS and FMI), another puts South in the center. Here is a televiewer and core photo of the same fracture. The sinusoidal shape of the fracture trace is very obvious. In this image, South is in the center of the track and the fracture is oriented N 70 E, with a thinner, steeper fracture at N 45 W.
Fracture identification is easiest when several detection methods are combined. This is illustrated in Figures 28.31 and 28.32, where sonic variable intensity and televiewer images are used. If density of the rock is also measured, numerous elastic properties of the rock can be derived, which are useful in hydraulic fracture design and sanding studies. The televiewer has a few advantages over the formation microscanner. These are the ability to see 360 degree image of the borehole, no need for pad contact, ease of use in oil base muds, high resolution acoustic caliper, and better steep bed definition due to shallow investigation. The microscanner has better resolution in rough hole and has higher dynamic range due to using resistivity contrast instead of acoustic impedance contrast. direction at right angles to this axis. On real, logs check heading carefully, as travel time and amplitude images can be interchanged in position, and North may be on the right or the middle of the track. A resistivity image log has about 10 times the spatial resolution of an acoustic image log and 500 times the amplitude resolution, due to the difference in contrast between the resistivity and acoustic impedance ranges measured by the respective tools. Since Y is measured on a plot or CRT, it must be transformed into actual wellbore distance by multiplying the measured distance by the plot scale. Note also that near vertical fractures will appear near vertical on the plot and do not form sinusoids. 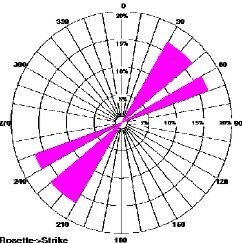 Fracture orientation is determined by the azimuth of the sinusoid troughs, read from the direction scale at the top of the image. If image logs are not available, there are other techniques that might be helpful in estimating the orientation od fractures, described below. When formation pressure is isotropic (equal in all directions), the tectonic stress is zero and Pfrx equals Pfry. In this situation, the borehole is round and spalling of the formation is either non-existent or equal in all directions. In stressed regions, such as in the Rocky Mountains, the borehole will erode to an oval shape. The minimum diameter shows the direction of maximum stress and the maximum diameter shows the direction of minimum stress..